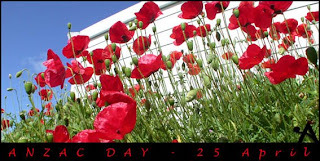 Today Saturday 25th April is when Australia celebrates its rememberance day for War dead from WWI thru to Vietnam, its a public holiday and is celebrated by a dawn service in France, Gallipoli (Turkey) and all over Australia. ITs not just a moment when veterans remember their lost mates but is also taken seriously by the youth who remember what past generations did to fight for freedom. This is what the BBC Reporter here has to saw about ANZAC Day. Off now to watch Billy Connolly on tv going around Canada.